Reading, writing and restaurants. For more food try here: stellabites.blogspot.com. The brownies are here: stellanewmansbrownies.blogspot.com. It is also proof to me that there is a God, in this case a pastry God, in the form of Justin Piers Gellatly, Executive Baker and Head Pastry Chef of the St John empire. Starting out at 15 washing dishes, he’s worked in the business for 23 years, the last 11 of them with Fergus Henderson at St John. As well as being in charge of St John’s legendary breads, now served at over 30 top London restaurants, Justin looks after all their baked goods. He recently did a spot of catering for a certain royal wedding – 2000 rolls – toasted rye, white sourdough and raisin - plus some buttery buns for the morning after bacon sarnies. And he is the inventor of THAT Doughnut. First things first, Justin wanted a brioche-inspired, buttery dough. He uses Lescure, a French butter with a low water content and drier texture, to ensure perfect consistency. The finished dough combines strong white bread flour, butter, salt, sugar, eggs, yeast, water and lemon zest, which lifts and offsets the dense rich custard inside perfectly. Strong white bread flour. Great packaging, no? Justin trialled around 50 doughs over 6 months in development, encountering over-exuberant yeast and exploding doughnuts along the way. The custard was a different story and he nailed it first time. He mixed 50% Crème Patissiere (to chefs, what concrete is to builders - Raymond Blanc) with 50% Crème Chantilly (double cream mixed with sugar and vanilla.) The result is a luscious thick, rich yet light vanilla dream. It has a fullness to it that feels as satisfying on your tongue as a water balloon in your palm. When Justin presented the finished prototype to his boss, there were nearly tears in Fergus’s eyes. 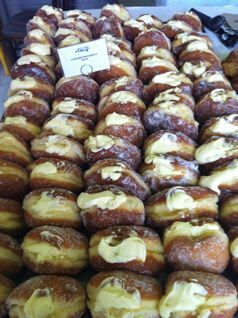 Justin and his team now bake 500 donuts at a time for St John Bakery in Bermondsey on a Saturday morning, and another 100 for St John Bread and Wine in Spitalfields on a Sunday morning. The custard is made in the wee small hours of the morning. The dough is divided and rolled into 47g balls, left to double in size in the prover for two hours, then arranged in batches of 25 per proving tray – then fried quickly in vegetable oil. After a brief pat with a paper towel, each doughnut is given a good roll around in sugar, left to cool, then hand-piped to bursting, full of custard. At close of play there are never any doughnuts left. Not one. Ever. If I worked in this bakery I’d be fired on day one for eating the stock. How often does Justin allow himself a taste of his own confections? Turns out he hasn’t eaten a custard doughnut for a few months. That’s the thing about gods; way more will power than us mortals. ‘I crave cornichons!’ he says by way of explanation. It does make a certain sense – a salty, acidic, sour counterbalance to the richest, creamiest sweetest puff of joy imaginable. If you are brave and want to try recreating these at home, the recipe can be found in Beyond Nose To Tail. If I were you, I’d leave it to the doughnut masters. Just get here early. Cheese- Roquefort , Water Biscuits and Ruby port. * Keats, who wrote Endymion (first line ‘A thing of beauty is a joy forever…’) used to live a stone’s throw from St John Bakery, in Tooley Street. **Did you know it is illegal to own a ferret as a pet in California and Hawaii? Meat Liquor - the famous Dead Hippie burger, and how I turned in to my dad.